Red Dwarf - Better Than Life is the second and final instalment of this hilarious sci-fi comedy. 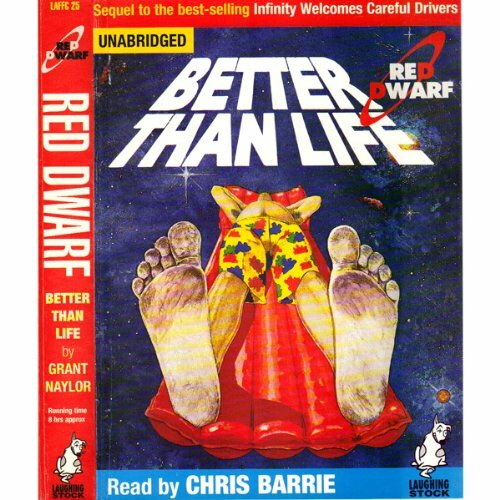 Narrated by Chris "Rimmer" Barrie, Better Than Life finds the crew trapped in a mind-boggling computer game that is threatening their lives and safety of the ship. One by one, they enter the game to rescue each other - and one by one, they become trapped! Holly will have to use his mega brain to solve this one. Chris Barrie's performance is among the best I have heard. Hilarious and touching, a tour-de-force! Chris Barrie, need I say more? The story is good, but the narration is spectacular. Chris does very good voices for the whole crew, don't miss this one. Chris Barrie was perfect. He brought it all to life. Wish there were 10 more! I watched the TV show years ago and my recollection of the plot has faded significantly. After they solve a problem I usually think "a-ha, I remember now" but fortunately I have forgotten enough that the story seems fresh to me again. It's great hearing the crew again as they revisit their old roles in this dramatized version of the book. If you liked the show then you will enjoy this book - it is the same plot lines as the TV show but it was like putting on a favorite old sweater. It just felt good. Narration again by Chris Barre Himself who Played Rimmer in the Original BBC TV Show, does an unbelievable job, and despite only him Narrating he does the voices of Holley, Lister, Cat and of Course Rimmer beautifully. The plot of the book loosely adapts episodes from the Seasons 3-4 of the BBC Show, and uses the novel format to explore the characters backstory more than they ever could in the half-hour episodes while expanding existing scenes far beyond the means available to them on the television series' budget and runtime. Where are the other two books in this series!!! I love the show and I love these two books. I hope that they bring the rest of the books into the Audible. A good condensed retelling of the BBC series, with Craig Barrie's uncanny impressions of the cast, not to mention is perfect reading of Rimmer. It took me a little while to get through the first few chapters, but I was so glad I did. Hilarious characters with truly clever humor and fantastic dialogue. Chris Barrie is a genius at impersonation, and the character voices are one of the highlights of the audiobook. I never read the same book twice, but I feel the urge to listen to this one again. Chris Barrie! Do more narrations, pleeeeeez! More than just a novelization of the show, the story adds explanations and details missing in the t.v. eps, and gives us whole new adventures. Mr. Barrie brings it to life. One forgets that one is not listening to a full-cast dramatization. Really! He's that good. Buy it and enjoy. Chris Barrie is MARVELOUS!!! Thank you Audible for making "Infinity Welcomes..." and "Better Than Life" available!!! I've worn out my cassettes !!! Please consider offering "Backwards" and "The Last Human". There's definitely an audience for them, especially considering RED DWARF XII just wrapped!! !